We've just returned from a few days up in Winter Park, CO with John's family. It was snowy, cold, beautiful, and so much fun! We rented an amazing condo (thank you, Papa and Mimi!) that had a terrific view of the ski slopes. We originally thought some of us would ski, but we decided we'd rather spend our time doing something we could all do together. Oh my gosh...it is so much fun. We loved it so much that we went back again the next day! My favorite part was riding with Abbey. She would giggle the entire time she was flying down the hill. It was so cute. We also loved hooking all of our tubes together and making one big amoeba or one long chain. The more people you have, the faster you go! The best part though is that you don't have to walk back up the hill...they have a "magic stairway" (conveyor belt thingy) that carries you back to the top. Will was overjoyed about me taking his picture. Abbey didn't want to ride, so she patiently watched everyone else ride played in the snow while we watched her brother and sister and two cousins. I think it snowed every day we were there! I was thankful for that since not all of our family lives in a place that sees snow very often. And isn't that what you hope for when you visit Colorado anyway? Another fun thing we did was take a sleigh ride. It was snowing and so cold. Very picturesque indeed. 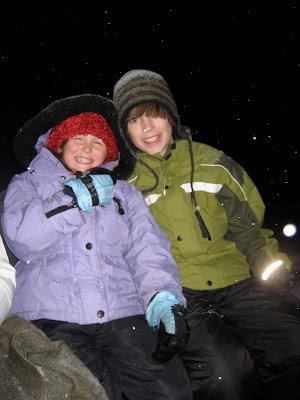 Midway through the ride, we stopped and warmed up around a campfire and had hot cocoa. Love it! It makes me so happy that y'all had this kind of time!!! I love the sleigh ride, too, with cocoa in the middle of the journey. That's my my kind of fun! How fun! I'm so glad you guys had a good time. The first tubing picture is great! It could have been a Christmas card photo. Beautiful...and looks like so much fun! It looks absolutely wonderful! We have done Winter Park in the summer which was also VERY fun! The snow looks awesome though and the sleigh ride...wow! 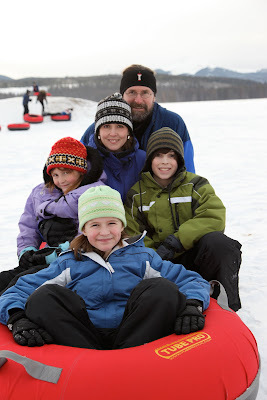 Love the 1st tubing picture of your family! 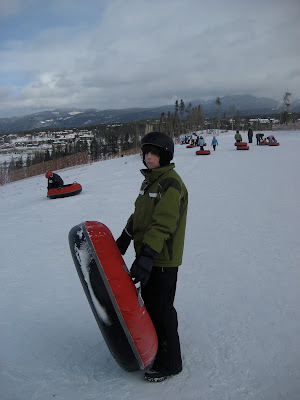 I so wish we would have went tubing that year in Winter Park....it looks like lots of fun! The one at Cooper didn't look that great so we skipped it but we did go on a sleigh ride. Glad you all got to do that w/the whole family! Love your picture of the driver, horses, and scenery. That looks like sooo much fun! We have talked about taking a trip to Colorado in March, but Idon't know if we will not. If we do, I want to go tubing! Several years ago, we were there, and did a sliegh ride. I think that is my very favorite Colorado memory! I saw Kathy S. (now D.) at a new church that we have been visiting the other day. Weren't you all roomies in college? I need to tell her that you have a blog that she can read to see what you are up to! I was just going to say the same thing Deena did about the tubing picture. If not card-worthy, for sure frame-worthy. That sounds like a close-to-perfect trip! Glad you all had such a great time!! Great photos, too! Abbey cracks me up. I'm totally inspired. We struggled last week to find things to do -- mostly because our kids are so young. I cannot WAIT until everyone is a little older. I will insist we rent a family condo in the mountains for Christmas. Tubing? Sleigh rides? Lots o' snow? Sounds like a perfect vacation. Looks like you all had an amazing time. I loved the photos. I can't get over how much your kids have grown. You look gorgeous! Thanks for the family photo and newsletter you all sent. It was great to see/read/hear! I have never.ever. in my life seen such beauty!!! Our "dustings" here in the south are beautiful when they happen but wow. I just can't imagine experiencing all of that white beauty! Such a beautiful family you have and looks like such a super fun time!! You are blessed to be there! Makes me want to pack up and move. I want to live in winter wonderland with very little summer heat. So glad you all had a wonderful time! What a great picture of the 5 of you with the intertube. Glad you had such a great time. Looks beautiful. It might be overkill at this point but that first picture of the 5 of you is absolutely PERFECT. How incredibly fun!!!!!!!!!! Soooooo beautiful! Ya'll are blessed indeed! That looks like so much fun! I love tubing (and skiing). What a nice treat for you and your family. I love winter sports ... and cozy togetherness! It looks like you had a fantastic time. 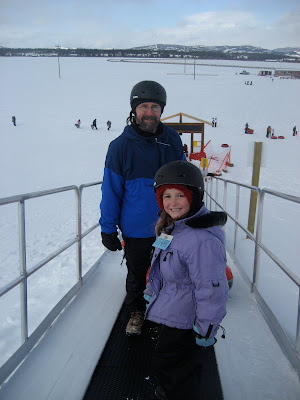 Though I don't miss snow, I do miss tubing!!! yeah, lady... the family picture is fantastic! what beautiful people you all are. 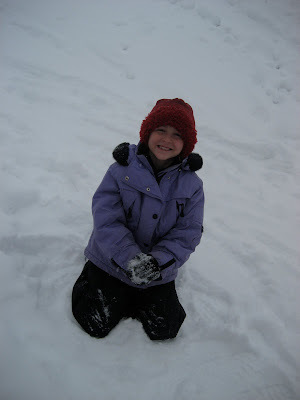 love, love, love hearing about life in the snow. I wonder if there is any possibility I'd even LIVE through the snowy weather after being so spoiled, or if I'd embrace it? I guess i'll find out when we're neighbors. Your visit looks AMAZING! I haven't skied in years and would love to, but the tubing looks so fun too. Some friends of ours rented a bunch of snowmobiles for their entire family and had a blast. I'm so glad you did too! That all looks like so much fun!! Love the tubing, the sleigh ride and the campfire. What a blessing to have that time together as a family. FUN!! I'm almost inspired to be less of a whimp. :( I am not loving this snowy winter without a yard. Looks like so much fun! I sure wish we had the conveyor belt thingy when we were kids tubing. I LOVE the tubing picture of you all. Such a great shot!!! Looks like a blast. Those pictures are amazing! Your family is so beautiful. However, I cannot imagine all that snow...Maybe its because i have never, ever (not even once) seen that much snow all at once, but my fingers are getting cold thinking about it! What an amazing, amazing, trip! It all looks so dreamy...the tubing, the sleigh ride, the fire and hot chocolate. So glad you all got to get away together!